LOL. I had to google Willie Wilson. While I do agree, honestly, with the amount of earth the park district has moved on that island in the past decade, I have a hard time believing they will plop a runway back on top of the lagoon. Parks don't generate tax revenue. Airports do. Exactly! And especially stupid parks like this one. It’s not really near anything other than McCormick Place. 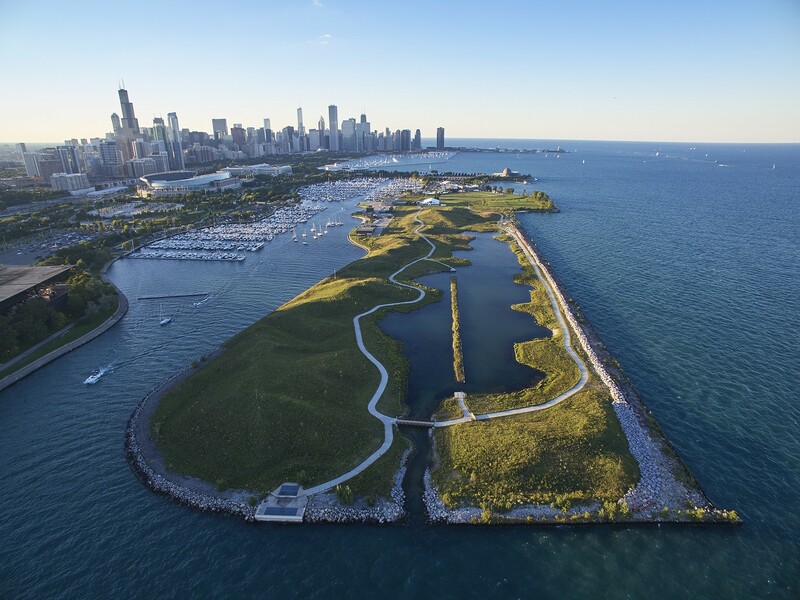 People visiting Chicago or living downtown go to Grant Park when they want to visit the park, not the flat featureless Park where Meigs is. I always thought it was a campground? Have been there a few times over the past few years. Minimal improvements and limited usage. Guys, you're preaching to the choir here, but that's not quite accurate on a few fronts. 1) There have been a ton of changes to the field itself, to the tune of about $7+ million of earth-moving and dredging. I doubt there is a runway going back onto this space. 2) There is a giant revenue source in the Hungtinton Bank pavilion (30,000+ capacity), which hosts concerts, festivals, weddings, fireworks, sports tournaments, etc. from May through September. When it's open, there are events weekly, sometimes several events a week. This is huge revenue source; I don't know the exact figures as compared to Meigs, but it you lump in the all pavilion events combined with increased Adler parking usage, it would not shock me if the field generates more revenue as a tourist destination than as an airport. I can't take those #'s seriously. Have to take those with a huge grain of salt, and honestly, the wait that interview reads, Mr. Wilson makes it seem like reopening Meigs is some miracle cure-all. It's downright laughable. Meigs was seeing about 46,000 flights/year at the time of its closure. Not too mention, it's not like the city lost 100% of that GA/FBO business, as some of that obviously moved to MDW, and to lesser a extent, ORD. Secondly, can anyone explain how the city was netting $11,000 per flight at Meigs if Willie's $500m income figure is to be believed? Furthermore, this Trib article from 2013 states that the city was grossing over $2 million from just a single concert promoter, and charging additional annual fees, per ticket carges, etc. Realize this a gross #, but I can't believe if one concert promoter grossed in excess of $2m in 2013, that that the city nets only $55,000 in 2018, with a venue that has only expanded its revenues and options since then. Not to mention, that figure doesn't include concession or parking revenues. O'Hare and DTW trading ground stops overnight due to ice and snow. ORD now open and accepting 28C&R arrivals. "Hilton Hotel could impact O'Hare Airport global terminal design." Some interesting comments from the CDA quoted in this article. Sounds like after the 10-year extension, a full-blown "do-over" could open the door to fully-realizing Calatrava's "garden" design. I think Studio ORD's proposal with some office space atop the garage is also cool. On another note, I stopped by the exhibit at the Chicago Architecture Center and purely anecdotally, the Calatrava design definitely seemed to have the most attention and 'ooos' and 'aaahs.' I have to admit, I think I do rank it slightly ahead of Studio ORD now after seeing the model. Studio ORD is still great though. I think the city has to make a decision on what they are going for: something epic (Calatrava) or something cool but more practical (Studio ORD). I met someone who works at O'Hare and he told me that in terms of airplane movements it was busier 15 years ago than it is now. I found that hard to believe so I checked. He was correct. O'hare's busiest year = 2004 with 972,248 movements. Can anyone explain why it dropped after then? Larger aircraft is my guess. Mostly the mergers and yes larger planes. Fuel was cheaper then. The mergers were desinged to consolidate competition and eliminate unneeded seats in the sky. ORD had more frequency and this was right when the regional boom was hitting. Now there is less frequency, larger regional jets, less overcapacity, planes are more full with less of them flying. Thanks. Makes sense since passenger count increases steadily every year. 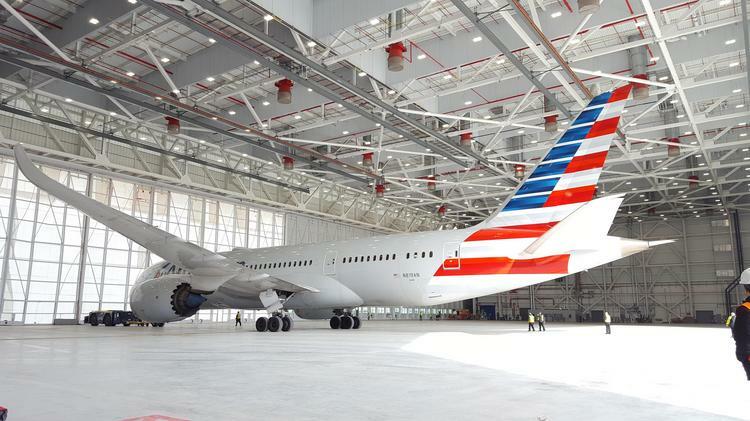 AA opened Hanger 2 today at ORD. The first new hanger at the airfield in 30 years, and now, also the biggest. Big enough for two 787s or six 737s. ANA Cargo used to fly to ORD around 10-12 years ago I believe. They used a 767F that went KIX-ANC-ORD. I don’t remember if they served NRT or not but I’m fairly certain they did KIX. 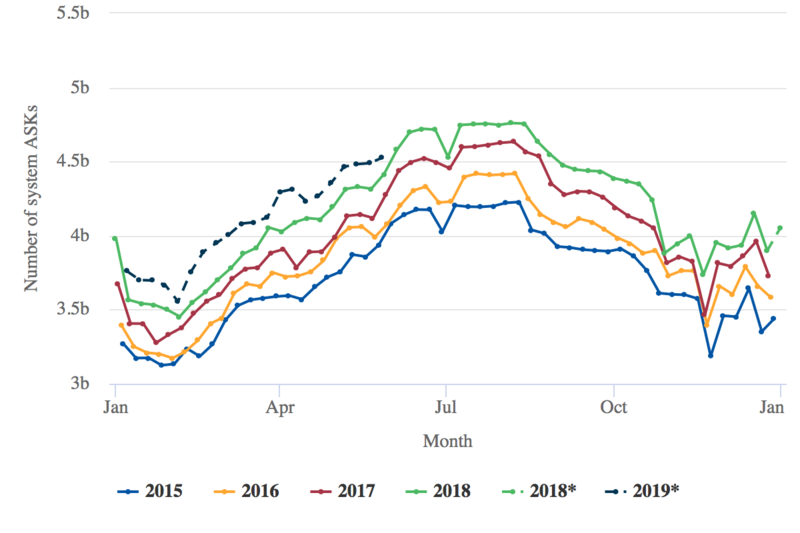 CAPA ran a cool article that details the passenger growth at ORD over the past few years, with some really interesting graphs. 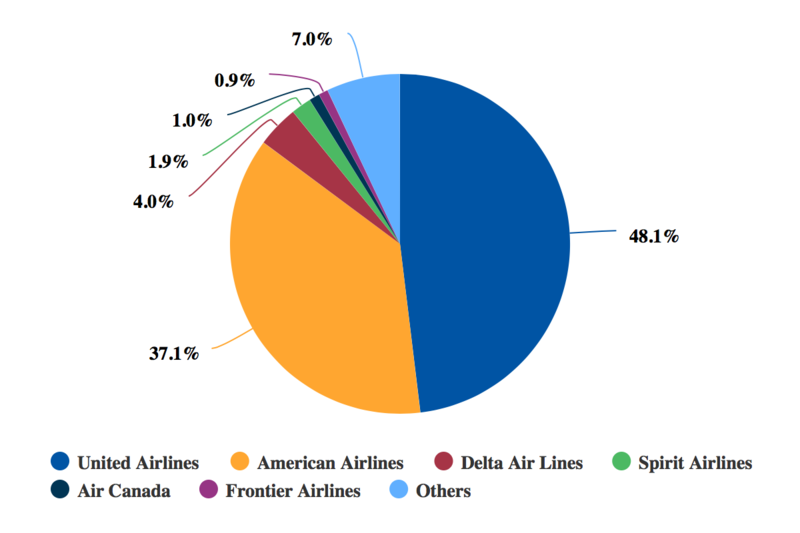 Long-story short, United rebanking is starting to pay off, while AA playing catch-up. 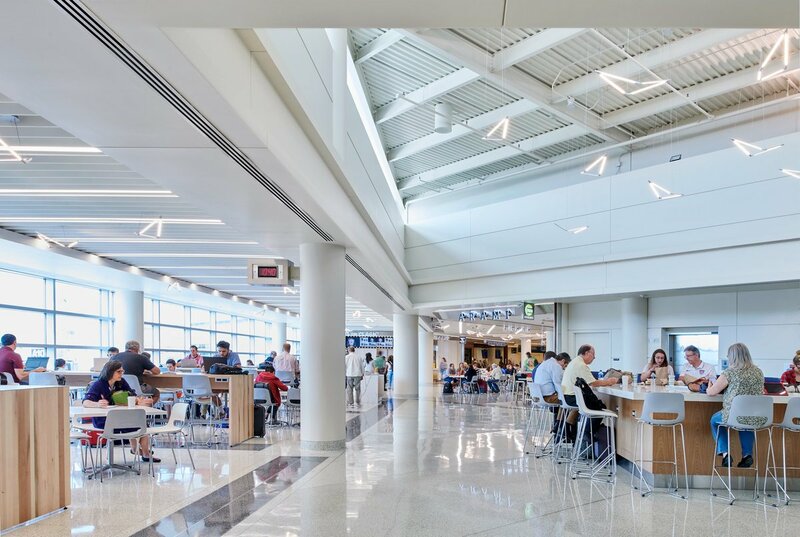 Yes, costs will go up during/after the renovation, but this is also true for most major US hubs as renovations are happening across the country. "The company notes that other gateways, including New York, Los Angeles and San Francisco, are also facing steep increases to airport costs but haven’t experienced adverse demand shifts because of their market strength. The same conclusion could be drawn for Chicago O’Hare. Even as its costs are likely set to rise markedly, the airport’s leading domestic and foreign airlines have approved new leasing agreements that include the new capital plan, said Fitch, “and therefore recognize both the value and the cost implications to maintain service in a strong Chicago market. 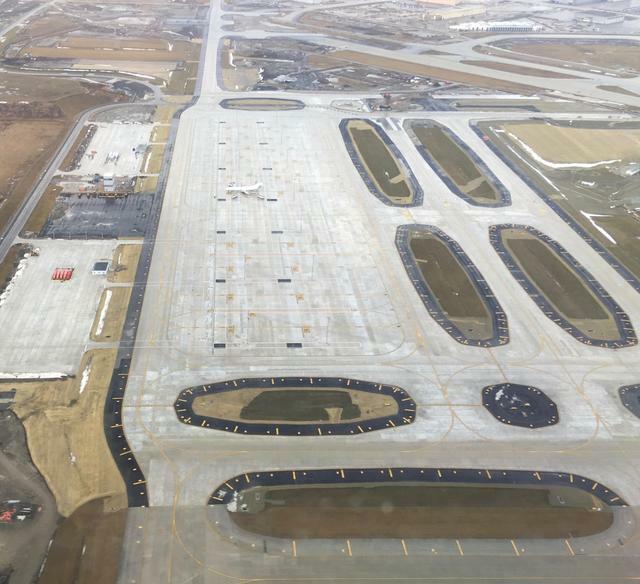 And even as costs are set to rise, growth at O’Hare continues. Data from CAPA and OAG show O’Hare’s ASKs are scheduled to increase year-on-year in early 2019." ET is increasing frequency to ORD, going from 3x weekly to 5x. I'm assuming traffic has been good for ET and happy to see the increased frequency. As noted per link below in another thread, just thought I would share here. Nasty out there. ORD is on a ground-stop. Update at 8:30pm Central. Departures off of 28C. What’s the special occasion? The most obvious proof for intelligent life in the universe is that they haven't tried to contact us. They're back to 28R departures already. Winter operations these days have been... unusual! The machine must (try to) continue! One more (small) step at Midway towards new retail/concessions. The latest: coffee by Big Shoulders. "The new Big Shoulders kiosk at Midway is the newest of 70 food and retail brands opening shops at Midway in coming months as part of a $75-million concessions redevelopment led by the CDA and the Midway Partnership, the consortium of partners tasked with orchestrating the airport's concessions overhaul." I also found it on CH Aviation news as well. Already under construction, east of current Widebody facility. Both AAs and UAs are replacements for current structures being removed for new runway. That's great news! I love Big Shoulders coffee, and happy to see another hometown brand at MDW. Really the CDA has done a great job so far with the remodel, and I have to give my compliments to them. I feel like a lot of people on here are critical of the CDA sometimes (I've lumped my fair share of criticism at them), but I've been very impressed with their MDW work and I give praise when it's due. They've done a nice job of updating/refreshing within the existing architecture of the terminal, without going overboard or feeling tacky. I feel like some airports go over the top with concessions/retail aspects and some of these newer terminals feel more like malls than airports. I don't get that vibe at MDW - concessions are well integrated. Hope this comes through when all said and done. "Who won the O'Hare design poll? The city won't say." Well moments after praising the CDA, I've just come across Greg Hinz's piece in Chicago Business about the global terminal poll. To be fair, not sure I blame the CDA for this as much as the mayor's office. As Greg says, it's pretty lame that the city won't release the results of the poll until AFTER it's made its final decision. No surprise there, frankly. I thought it was a harebrained idea to set up a public "vote" for the best design... like its some sort of American Idol for architects. If anyone wants my vote (as if), I come down on the side of Foster +. I agree with Karmin: their plan would be an "enthralling gateway"
Some bad news, seems that IG (Air Italy), will not be flying to ORD this summer. The airline has postponed service until 2020. There is an article from an Indian newspaper with the official announcement in the Air Italy drops DEL/BOM thread. Kind of surprised that they’re apparently keeping the LA and SF flights so far. I would think ORD would be cheaper to operate and can get away with just 1 plane. Not sure they can do that to the West Coast but maybe so. The three weekly flights that were originally planned for MXP-ORD in May are now being redistributed for MXP-YYZ, which is increasing from 4 to 6 weekly and MXP-MIA, which is increasing from 4 to 5 weekly. IG dropped all flights to Asia only a month after launching them. Seems the same with ORD, which they just announced a little over a month ago. 2020 doesn't sound very promising for launch either. Starting Monday (1/28), with the snowstorm that went into morning rush, there were 1,157 cancellations at ORD and 215 at MDW. Then the Polar Vortex started on Tuesday (1/29), which began a very long stretch of cancellations at both airports, saw 273 cancellations at ORD and 274 at MDW. Wednesday (1/30) was by far the worst day which saw 1,530 cancellations at ORD and 333 at MDW. Finally, today (1/31) saw a minor decrease but not by much as there 1,431 at ORD and 255 at MDW. In total the last four days have seen 4,391 cancellations total at ORD and 1,077 at MDW. These figures don't even take into account the large of amount of delays that both airports saw during the same time span. I guess the only saving grace was that it happened mid-week in January which is typically the slowest travel season of the year. I realize that conditions the last few days have been very abnormal, but it seems like more could be done to limit this many cancellations. Other airports like MSP seems to handle this type of weather better. Sub-zero cold weather has been around for as long as Chicago has been in existence, but these amount of cancellations seems to get worse each year. 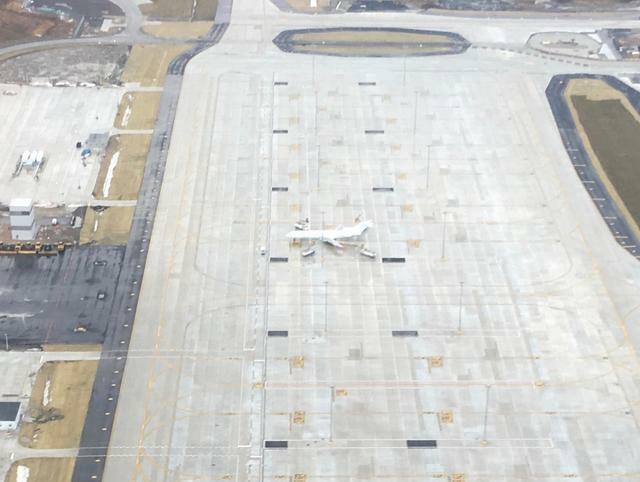 ORD trivia: Anyone know the story of this 727 parked next to AA383's one-winged 767? Photo taken yesterday (2 Feb). Former FX donated to the city for emergency service training. AA and UA use it for deicing training as well. It was recently painted white from the FX livery with the titles covered up. Well I know it is a former Fed EX 727, I'm assuming it was donated for safety training or something along those lines. Of course we all know the story of the former AA 763 next to it. Of course we all know the story of the former AA 763 next to it. I will admit, the SOM design has grown on me - I don't think it's the worst of the bunch by any stretch, I think it's a perfectly good (practical) design that I would be okay with. But it doesn't stir the soul, so to speak, in the way Studio ORD or Calatrava do. Personally, I think the Foster design is the worst of the bunch now. I'm not trying to make excuses for the CDA, but I don't think its quite an apples-to-apples comparison with MSP given the volume and frequency of flights at ORD. Furthermore, there were many flights delayed at origin with this past storm as well, including at MSP, but it doesn't get the press or attention that ORD gets in the national media. Not sure I agree that weather delays are getting worse every year; I don't have the stats to back it up, but subjectively, I think it's better now than prior to or during the early years of OMP runway reconfigurations. If anyone has hard historical stats on delays over the past 15-20 years, I'd be curious to see them. Did ORD beat ATL for 2018 aircraft movements? Anyone have the Numbers? Or projected? ORD was officially named the 'busiest' airport in the US with 900,000+ movements. Wow, great news! 4.2% y-o-y growth, and the article says ORD+MDW combined for over 105m pax, that's giving ATL a run for the money, possibly beating it? The Trib breaks it down a little, stating "O’Hare also handled more than 83.4 million passengers last year, a 4.5 percent increase over 2017." So even though we don't have the CDA data yet, we know ORD was well past 80m. The revamp can't come fast enough - I wish T5 work was underway already! Congrats to ORD! Looking forward to seeing more growth in the years to come. Got to love the little twitter exchange between ORD and ATL. ORD gleans with excitement and ATL rebuts ORD by stating they are still the busiest by pax and the "most efficient". I'd say ATL's days as the busiest by pax are numbered. Likely a foreign airport will overtake it in the next few years. Plus, ORD will close the gap in that regard once the new terminal space is built. And if UA/AA ever start upgauging, that could help close the gap as well. Heck, I even expect DFW to one day challenge ORD/ATL for the busiest in the US. O’hare operate far more regional jets than Atlanta...that’s why it’s busier. Busier is busier. And i believe there are fewer 50 seat jets operating at ORD now than 10 years ago. With the numbers of movements continuing to grow, and more 76 seat jets taking the place of 50 seaters, it might just be a matter of time til ORD is tops in pax again too. But that's years off still. And ATL is the busiest because DL routes almost half of their network through ATL. Does Atlanta even have a thread lol? Because I have never checked and don't care to. Those RJ's feed foreign flag code-shares and other long-haul non-stops that ATL will never see. When is EK coming there, NH, NZ, SK, I could go on...? Everyone knows if ORD could accommodate LUV, it wouldn't even be a contest. Let's revist in a decade after O21. 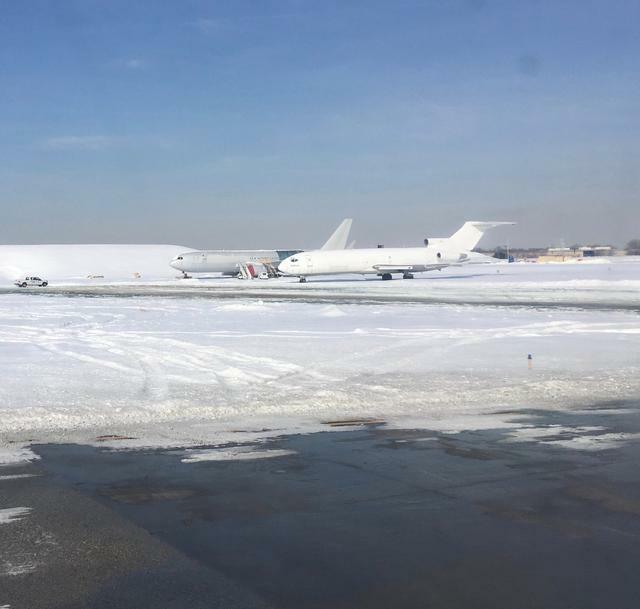 That 727 (post 131) has moved over to the new de-icing pads. I photographed the area on my way out yesterday (taking off from 28R, 7Feb - sorry for the poor quality) which shows progress: pads are numbered, access taxiways seem to be complete and you can see training in progress with four trucks around the ex-FedEx aircraft. As far as I can make out there are 12 positions, although I imagine the size of the a/c determines how many of the 12 are usable at one time; they all seem to be the same size. What's hard to see in your picture are the free standing light poles between the spots. Within each "area" you have the ability to park 4 regional's or one widebody. The ramp tower has enough positions to allow UA/AA and OA's staff to coordinate their own operation independently of each other but still communicate between each other on aircraft movements. The ability to use the pads have been available for a while. However, both UA and AA still had some internal issues to work out before they do. The two regional deice pads on the T5 ramp will remain in place through this winter season but will go away once the expansion starts. What's hard to see in your picture are the free standing light poles between the spots. Within each "area" you have the ability to park 4 regional's or one widebody. Thanks for the clarification, jcwr. So if I'm counting correctly, that would mean up to 20 rj's at one time, assuming no larger jets are being de-iced at the same time; unlikely perhaps, but this gives some idea of the greatest capacity. I look forward to full operation as I know first hand the effects of de-icing at the gate: for incoming flights a wait in the penalty box for the gate to open up and a potentially missed connection. I wonder what the amount of water it is that they're dealing with.